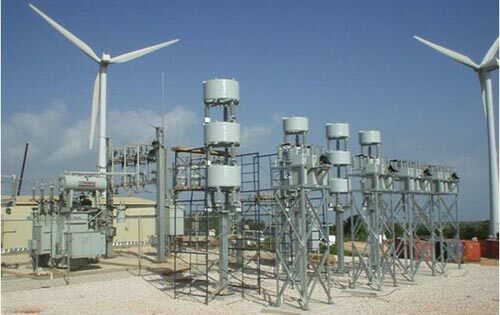 Capacitors installed by Leecorp and Qvarx at Wigton Wind Farm, Jamaica. After the Petroleum Corporation of Jamaica (PCJ) had commissioned the country’s first wind farm generator, it was discovered that it was taking more reactive power (vars) from the grid than it should, making it less efficient as a clean alternative source of power. Enter Leecorp, which collaborated with Quebec, Canada’s Qvarx to solve the problem. Essentially the older wind turbines as installed at the PCJ’s Wigton Wind Farm, behave like huge motors that actually consume reactive power. So for a 20 MW wind farm a few percentage points below unity power factor that means a huge draw on reactive power from the network – in this case 7-8 mvar at peak output. If this is a commodity that has to be paid for, that’s a major dent in the wind farm’s income. The solution presented by Leecorp and Qvarx was centralized switching compensating capacitors with stacked reactors (see picture in this section), an extension of the 24 KV substation. The result after implementation was unity power factor and no net consumption of vars by the wind farm. 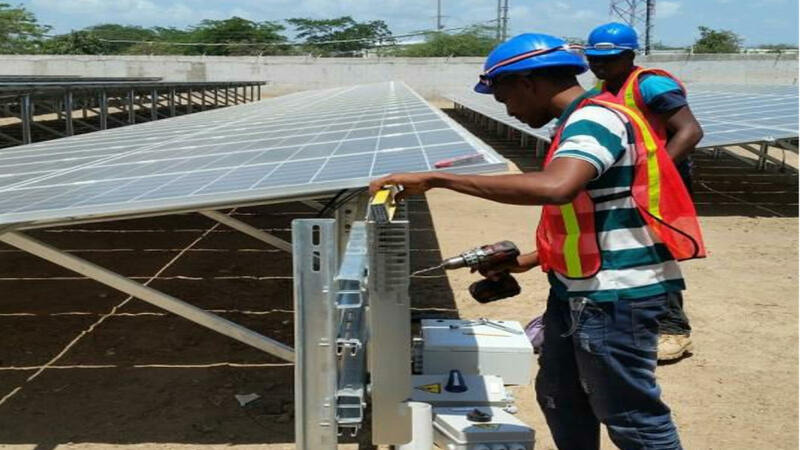 For further technical details of this project you may access a Power Point presentation at the Caricom Renewable Energy Developent site. The future of the world lies largely in finding solutions to our energy problems (cost and availability) and reducing our greenhouse gasses. The obvious solution is to optimize the use of renewables like solar, wind and hydro, but most importantly to improve efficiency. The cost to save 1 kw of electrical energy is a fraction of the cost to deliver the same amount of electricity by renewables so it’s always most cost effective to fully exploit all the options to improve efficiency before embarking on renewable generation. Leecorp can deliver all the above. We have partnered with various manufacturers to deliver renewable sources of energy to satisfy any requirement in the residential or commercial sector. We are very experienced, based on our industrial background, to undertake detailed commercial and industrial audits, which pinpoint the way forward to improving your energy efficiency and we have all the products and capability to implement those opportunities. For a quick evaluation of your renewable needs go the Department of Energy PVWATTS section.